Kavita Khan?s* three-year old son Michal is always asking for sweet treats. From breakfast through to dinner, he asks for cookies and candy after meals?even after he?s had plenty to eat. Often Kavita gives in, because saying ?no? creates an epic meltdown. But here?s the problem: Excessive amounts of sugar are linked to an increased risk of heart disease, type 2 diabetes and obesity?even in children. Plus, eating too many treats fills kids? little tummies, leaving less room for the nutritious foods their bodies need. Of course, a little sweetness can certainly be part of a healthy lifestyle, but kids should have no more than six teaspoons (24 grams) of added sugars per day (added sugars include any sugar, honey, syrup or other sweetener that doesn’t naturally occur in the food). The trouble is, most children get double or triple that amount. Creating sugar monsters is not inevitable though. Kids can be taught to enjoy sweets without becoming obsessed with them. 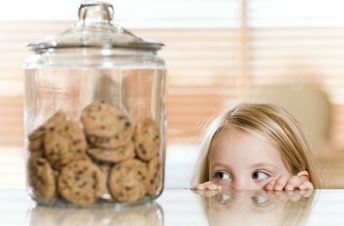 The rules parents create around treats play a big role in shaping whether kids obsess over them or normalize them as a part of balanced eating. Here are some strategies that can help.